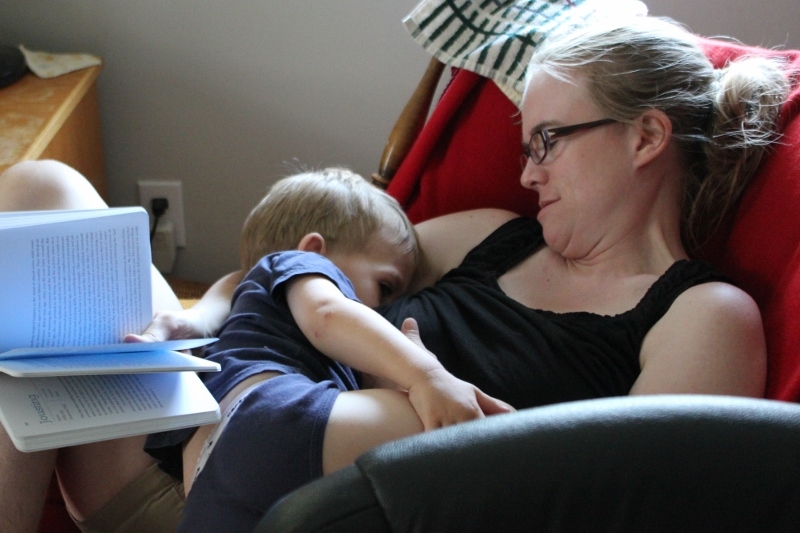 Last fall, as Mark was learning how to talk, one of his first words was, “Ick.” He would point at my chest, say, “Ick”, and then lean over as if to say, “It’s time!” It was clear that his word for nursing was “ick” and yet, really? Ick? Couldn’t he have come up with something better? (I think he equated nursing with our special blanket that Auntie Meggan made for us and ick does sort of sound like blanket.) I couldn’t help but laugh every time he asked to nurse! In December, while we were in Alaska visiting my family, he added the “n”of nursing and started calling it, “Nick”, which is, as we all know, also his father’s name. 🙂 So, even more laughs! After a couple weeks, he added the “ing” and starting asking for “nicking”. Eventually, sometime in January, he slowly transitioned to “nursing” and now he says, “I need nursing!” in a very funny voice that he usually saves just for requesting things. I must admit to some sadness when he started using the proper word. It was just a little too boring compared to “ick”! Along with toddler word acquisition, something else I love about nursing a bigger kid is that our nursing sessions are anything but calm. He often turns himself upside down while he’s nursing. We call it “gymnurstics” around here and that’s really the perfect description. I know some mamas insist that their babies/toddlers stay totally still when they are nursing and that’s fine, of course. It doesn’t bother me though (as long as he doesn’t get lazy with his latch) and it, too, is another source of amusement for Nik and me. Nursing is often the only quiet time that Mark and I spend together. He’d much rather be wrestling me to the ground or playing with his sister most of the time. So I treasure the few quiet minutes I get with him. He still nurses 3-4 times during the day (plus a couple times during the night) and I’m glad for the continued close connection with him. It’s my best parenting tool for calming tantrums, soothing fears and hurts, and welcoming bedtime. 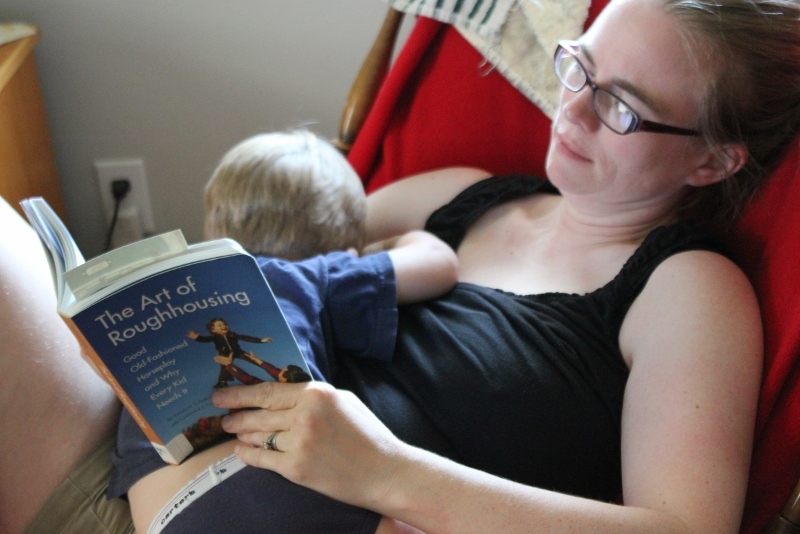 In short, I’m so glad that Mark, at two years, seven months, is still nursing strong. Ellie tells him periodically that when he’s four, he won’t get to nurse anymore. She’s convinced that he should nurse exactly as long as she did. We’ll see what happens but neither he nor I seem to have any plans of stopping any time soon! Last summer, I managed to take the pictures for this post but never wrote it. Hence, two years of pictures in this post! 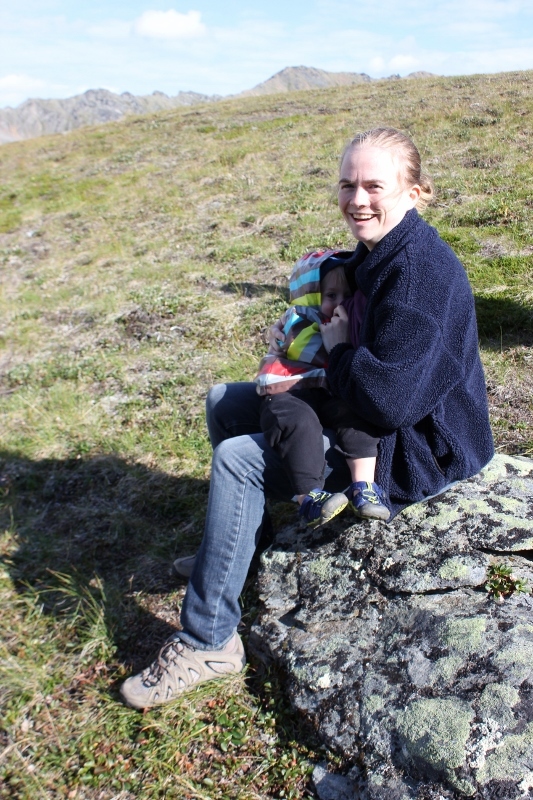 This entry was posted in Alaska, linguistics, Mark, nursing, parenting, politics, reflecting and tagged world breastfeeding week. Bookmark the permalink.